Can you believe it is already time for my favorite things again? I've been on a product kick and have been trying out some new things. I'm eventually going to share my skin care routine as things have changed up a bit but for now I'll just share my fav things that I've been all about this month. This is one of the most talked about bronzers on YouTube. 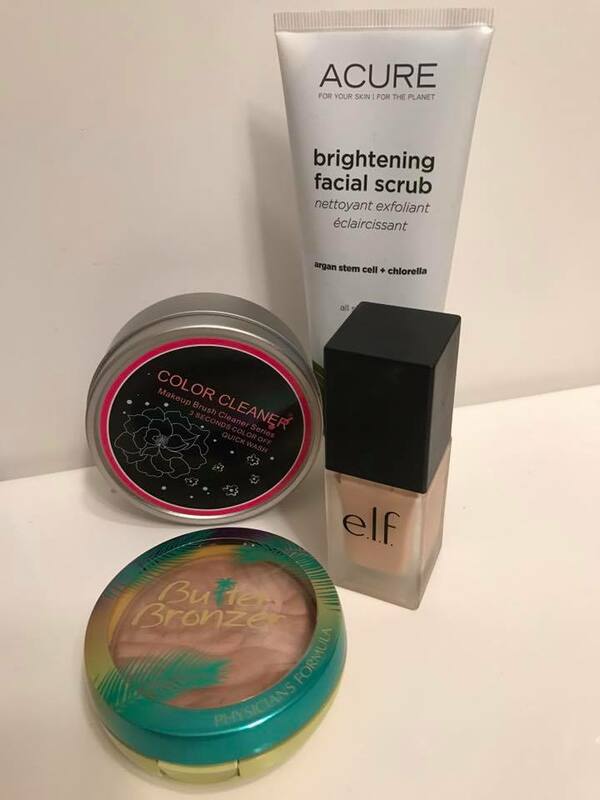 It isn't exactly cheap unless you get a 40% off sale at the drugstore (like I did!) It retails around $15 but it is awesome. It was totally worth the cost. It smells like a tropical dream! I would just sniff it all day if that wasn't too weird. The color is perfect for fair skinned gals like me and I think it would work up for fair - light tones. It warms my skin up so nicely without looking harsh or overdone. I have been having a hate/hate relationship with my IT Cosmetics foundations. They just look too cakey on my dry winter skin lately. So I had heard good things about this foundation from ELF and I thought at $6 why not try it. WELL. It looks amazing on! It last pretty well all day too. I don't love the scent but it doesn't linger so that's not too bad. I do like the look and it gives a light to medium coverage. The best way to apply is with a wet beauty sponge. Seriously try this one! This feels so nice. It is a harsher scrub so you don't want to press hard or keep it on too long. Just a few quick swirls and I rinse off. It really gets my skin deflaked well. I use this once a week and I've liked how my skin has responded to it. I will be repurchasing when I run out. 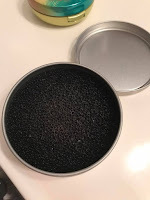 This is a very unique product it is basically a tin with a black sponge in it. It is used for removing some makeup off your brushes and giving you essentially a clean brush without any liquid. I love this for my blending brushes. I've been using it during the week to help me from having to deep clean as often. I still do the full on soap/water clean but this is just to give you a clean while your creating an eye look. I got mine off of Amazon. I've been watching The Great British Bake Off on Netflix. This is fascinating. I've never heard of hardly any of the baked goods they make on there. I've had to google more than one! I'm only on the first season but it looks like Netflix has three to watch so I'm excited about that. So that really wraps it up for me this month. What are some of your monthly favorites?